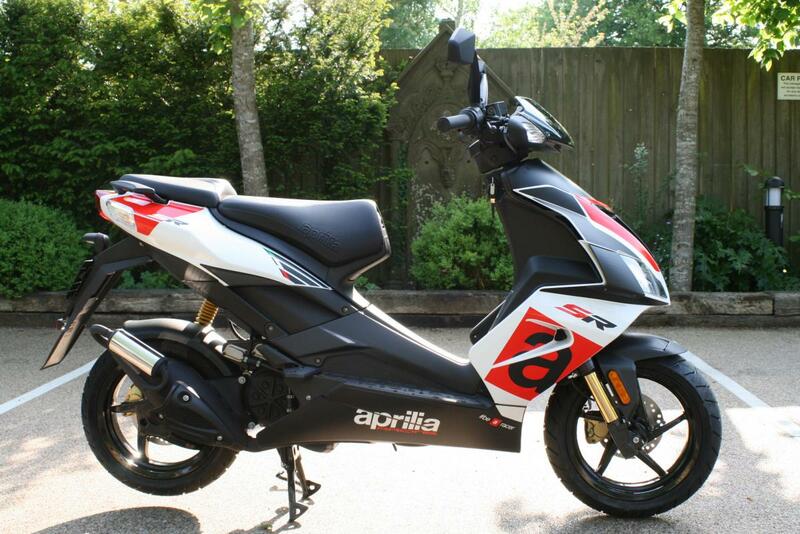 We are thrilled to be able to offer your this stunning 50 cc automatic twist "n" go scooter from Aprilia. THE SPORTS SCOOTER PAR EXCELLENCE. Low rate finance is available on this bike, credit subject to acceptance. Aprilia's superb 50 cc automatic scooter. Brand new, 24 months warranty and 12 months RFL. The sports scooter par excellence. Uncompromising sporting look with heavy references to the world of racing, Aprilia SR 50 R marries the technical and the aesthetic: its gutsy style inspired by its bigger Aprilia sisters is a real head turner. The tapered shield, the dual headlamp, the central air intake, the aerodynamic tail fairing with a rear headlight and built-in indicator lights, all emphasise its affinity to the Aprilia sports bike family. The new colours, Racing Black, Fluo Red and Racing White are aggressive and lively, with the right touch of style for a unique scooter. Low rate finance is available on this bike, credit subject to acceptance. For a no obligation finance quote, please call 01747 811196 and select option 1 for sales. Thanks for looking! !